Áður en ég hóf formlegt formlegt nám fór ég á mörg kvöldnámskeið; flest námskeiðin voru í módel teikningu hjá Hring Jóhanessyni; sem listamaður gerði ég mikið af tilraunum með stíla og efnistök; þessar myndir voru jafnan frekar flóknar í byggingu og áferð; ég hafði þá kynnst mörgum listamönnum sem höfði áhrif á myndgerðina, ég skoðaði næstum allar myndlista sýningar sem hingað komu og vill ég sérstaklega nefna Hundertwasser sem sýndi í listasafni íslands 1976; á þessum árum voru áhrifavaldarnir flestir íslenskir vegna einángrunar landsins og er fyrst að nefna Kjarval og septem málarana; sérstaklega Kristjá Davíðsson og Einar þorláksson; Ég hafði áhuga á sumum súrrealistunum; séstaklega Max Ernst og teikningum Hans Bellmer; áhugi á þeim var vegna hins sjálfssprottna sem þeir virtust vera að rækta þó var einnig ýmislegt hjá þeim sem mér líkaði ekki; læt einnig fylgja með mynd með spíral; en pírallinn varð eitt mest einkennandi fyrir mína list eftir 1980. Before I started study art, I attended many art classes; most of the courses were drawing model; as youn man, I did a lot of experiments with styles and subjects; these drawings and pantings were generally rather complex in construction and texture; I had seen somme a lot of art that influenced my artwork, I looked at almost all of the art exhibitions in Iceland. Hundertwasser who showed in the Icelandic art gallery in 1976 had a lot of influec on me ; in those years, the influences were mostly Icelandic because of the solitary confinement of iceland, and I must mention Kjarval and painters in the 60’s, especially Kristján Davíðsson and Einar Þorláksson; I was interested in some surrealists; especially Max Ernst and drawings by Hans Bellmer; the interest in them was because of the self-propelled ones they seemed to be cultivating for my, but there were also some things that I did not like wirh surrealism. I also include a spiral to my pantings; but the spiral became one of the most characteristic of my 1980s art. Þetta er abstrakt mynd sem tengist áhuga mínum á því sjálfssprottna. This is an abstract panting related to my interest in the self-propelled. Sum viðfangsefnin fylgja mér ennþá.Some of the motives still in my art. Spírallin er eitt mest einkennandi fyrir mína list. The piral is one of the most characteristic of my art. Ég stundaði nám í Myndlista og handíðaskóla íslands; 1976-80. Fyrstu tvö árin voru að mestu kennsla í teikningu, málun, mótun og ljósmyndun; gott grunn nám í handverki, sem ég er mjög ánægður með að hafa fengið að læra. Eftir grunn námið valdi ég mér Nýlistadeildina; einhvern vegin var enginn önnur deild neitt sérlega spennandi og mér fannst viðeigandi að taka smá áhættu þar; sem faðir minn hafði hálf þvingað mig til að læra húsgagnasmíði áður en ég færi út í myndlist, svo ég hefði eitthvað öryggi; ef maður fer út á listabrautina er sennilega eina sem er öruggt að það er ekkert öruggt, en ég hef ekki unnið mikið við smíði um ævina. Í Nýlistadeildinni vann ég mest ljósmynda verk og lítillega í kvikmyndum og performösum líka, þetta voru skemmtilegir tímar þar sem manni var sagt að allt væri leyfilegt. Ég var eitt ár í Ríkis listaakademæiuni í Amsterdam 1983-84 þar sem ég lærði Grafík. I studied in Icelandic Art and Crafts School; 1976-80. The first two years were mostly studying; painting, shaping and photography; good basic craftsmanship, which I am very pleased to did learn. After that basic education, I chose the New-media department; somehow, no other division was really exciting and I thought it would be appropriate to take some risk there; as my father had asked me to learn carpentry before I went to the fine arts, so I had some security; if you join the art as profession is probably one safe thing; that there is nothing safe, but I have not done much carpenter work in my life exept for my self and my art. In the New-media department I did mostly photographic works and litle bit of films and somme performances, these were nice times where one was told that everything was allowed. I was one year at The Rijksakademie van beeldende kunsten 1983-84 where I studied Graphics. Spiral teiknaður í móðu á gleri. Spiral drawing in a fog of a glass. En ef maður hefur smá nef þá finnur maður það sem ekki má og það var að mála málverk i þessu tilfelli. Síðara árið mitt í nýlistinni sem var orðin kannski soldið gamaldags þegar hér var komið. Ég var ég komin á fulla ferð í að mála og teikna; gouache á pappír og blönduð tækni á pappír . Sýndi með félögum mínum í skólanum verk sem voru hluti af umbreytinga ferli síðar var farið að tala um Póst modernisma sem að mínu áliti er byrjaður mun fyrr en ég er örugglega hluti af því ef það er til? But if you are in art school, you have to find what is not allowed and it was painting in the New-media department. My second year in expermental art I started painting I was doining a lot of painting and drawing; and mixed media. I took part in exhibition with my co-students in art school. My works were part of my transformational process, later I was a part Post Modernism which, in my opinion, it had started much earlier than I started but I am definitely part of if in Iceland? Ég var oft að hugsa um hvort listin ætti að vera hugmyndaleg eða sjálfsprottin. I was often thinking about whether art should be mental or spontaneous. Stærðfræði og tilviljun.20×30 cm. 1979. Gouache á pappír. Mental or spontaneous. 20×30 cm. 1979. Gouache on paper. Tilraun með handmálaða ljósmynd. Experiment with a hand-painted photograph. Polaroid ljósmyndir frá heimilis vinnustofuni. Polaroid photographs from the home studio. Eftir 1980 var ekki aftur snúið, málverkið hefði sigrað hjarta mitt og það var villt og fór sínar eigin leiðir. Ég hef alltaf verið frekar opin og það hjálpaði mikið við að vekja athygli á því sem ég var að gera í málverkinu. Ég byrjaði að sýna í Nýlistasafninu Gvass myndir, teikningar og klippimyndir. 1980 was no return; the art of painting had defeated my heart and it was wild and on its own way. I have always been open and it helped to draw attention to what I was doing in the painting. I started to show in a experimental art gallery; some of my Gouache pantings, drawings and collages. Einn af mörgum litlum teikningum og gouache á pappír.One of many small drawings and gouache on paper. Ég gerði mikið af gouache á pappír. 1979-83. I made a lot of gouache on paper. 1979-83. En eftir 1980 fór ég líka að mála stórar myndir í olíu og einkenndust þár af expressonisma, þetta tímabil stóð ekki lengi en var samt mjög skemmtilegt og við héldum jafnvel að málverkið ……………. Eftir nýja málverkið 1983-4 byrjaði málverkið hjá mér að verða flóknara með munstrum og líka einhverskonar and-hugmyndalist eða í einhverju sambandi við það sem sumir kalla póstmódernisma; sennilega er þetta ástand sem skýrist af vandræðagangi í sambandi við að vera listamaður sem er með hjarta í heimi; sem sjórnast af peningum, frekju og græðgi. After the new painting 1983-4; My type of painting began to become more complicated with patterns and also some kind of anti-ideology or some relationship with what some call postmodernism; this is probably a situation that is explained by the complications of being an artist with a heart in the world; that boasts of money, aggression and greed. Who is afraid of red yellow and blue. Olía á striga.140×90 1991.Who is afraid of red and blue. Oil on canvas.140×90 1991. Dæmigert fyrir andlega leitandi sál. Typical of a spiritually seeking soul. Ónafngreind. olía á striga 1984 110×130 cm. Untitled. oil on canvas 1984 110×130 cm. Vetrarmynd. 100×150 Olía á striga. 1984. Winter painting. 100×150 Oil on canvas. 1984. Grafík; hefur alltaf verið stór hluti af vinnu sinni sem listamaður. Art print; has always been a big part of his work as an artist. Hjarta skrímsli. Steinprent. 46 x 68 cm. 1985. Heart monster. Lithograph. 46 x 68 cm. 1985. Dæmigert dúkskurðar prent frá árunum 1983-6.Typical linolum black and withe print from 1983-6. Tungl og stjarna. Málm skurður og þurrnál, handmálað. 14×14 cm 1985. Moon and star. Print, hand colored. 14×14 cm 1985. Kærleikur. Æting. 14×14 cm 1988. Luv. Etching. 14×14 cm 1988. Eftir aldamót hefur myndflöturin hjá mér verið í leita að sama jafnvægi eins og ég hef verið að leita að sjálfur; það sem hefur hjálpað mér mest við að komast í það jafnvægi sem mér var nauðsynlegt er Sahajayoga; sem í raun breytir sjónarhóli manns og veitir manni betri aðgang að þeirri uppsprettu í sálalífinu sem ég mundi sækja minn efnivið í myndverkin; enda þó það sé ekki endilega leiðin að meginstraum fjármagnsins; er ég meira að leita að sátt við sjálfan mig. After the turn of the millennium, my art has been in search of the same balance as I have been looking for in my soul; what has helped me for the balance I needed is Sahajayoga; who actually changes a person’s perspective and gives you better access to the source of your soul that I would use as a source to myf art; provided that it is not necessarily the path of the art capital; am I more looking for harmony with myself. Vil gjarnan blanda saman miðlum, en að vera að búa til myndlist í viðbót við raunveruleikan er þá kannski skrítnasta blandan af ölluI would like to mix media, but to create art, as addition to reality is perhaps the weirdest mix of all there is. Fjöllin sem ég er að mála eru bæði rómantísk ættjarðarást eða fjallið fyrir hin andlega leitandi mann. 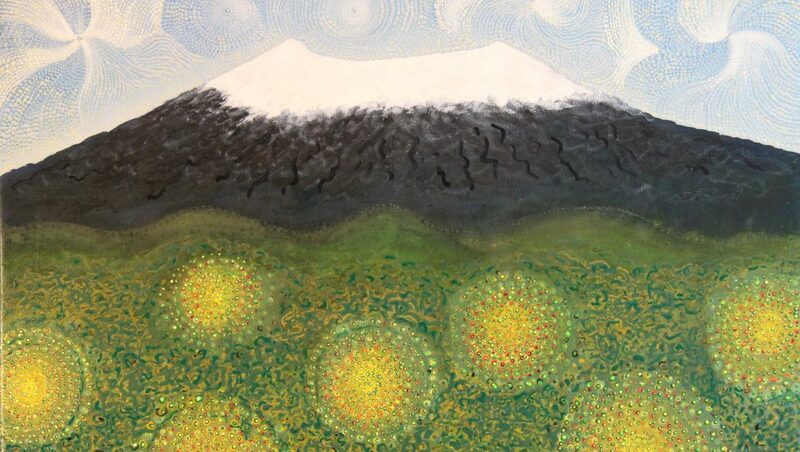 The mountains I’m painting are both romantic Icelandic landscape or the mountain for the spiritually searching man. Hér má sjá þjóðar fánan hvíla undir fjallinu. Here you can see the national flag resting under the mountain. Bílar þurfa að verða umhverfis vænni. Cars need to be environmentally friendly. Við erum að leita að jafnvægi í lífinu, hvort sem maður er meðvitður um það eða ekki. We are looking for balance in life, whether you are aware of it or not. Landslagsmálverk fyrir ofan sófan var eitthvað sem tilheyrði þegar ég var ungur. The landscape painting above the sofa was something that belonged to each other when I was young. Ég hef stundum unnið í önnur efni svo sem;blandaða tækni, skúlptúra og nú síðast samfélasmiðla; Facebook, Instagram og þessa blogg vefsíðu. I have sometimes worked with difrent media, such as mixed media, sculptures and the latest social media; Facebook, Instagram and this blog webpage. Previous postDaði fyrir 40 árum. Daði 40 years ago.